Our Beer Man has been doing some excellent work, of late. He has mentioned on a good number of occasions his unabashed admiration for the Bow Bar, on West Bow. I’d visited on many occasions for a glass or two of beer, but hadn’t sampled their pies, so took the opportunity to cram in a visit between Festival shows. Given that we usually have to remain abstemious due to work constraints, our Festival holiday in the city allowed the opportunity for a proper “pie and pint” lunch. Well, it was half pints, actually, as there were hour-long shows to sit through, later in the afternoon. I was joined today by long time reader but first time quester, Dan. We’ve long been united in our appreciation of the soups from Union of Genius and ran in to each other in their cafe, a couple of months back. This was us finally getting around to meeting for lunch. 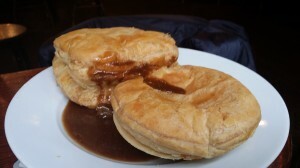 We were stifled in our aim to try their soup, but were happy to give the pies a good going over. Indeed we embraced our inner gluttons and decided to order two each Dan opting for steak & blue cheese and a bridie, while I sampled steak and their haggis, cheese & chilli pie. These soon arrived looking generously big and served simply in some lovely gravy. Made by Findlay’s of Portobello, they were extremely impressive items. 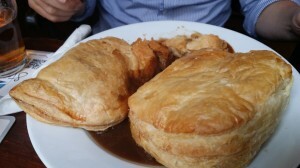 My steak pie was packed with meaty chunks, while the delicious haggis packed a nice chilli kick. The pastry on all of the pies was light and beautifully flaky. They were as good a collection of pies as we’ve come across in the city. So overall, the traditional pub setting of the Bow Bar held some outstanding lunchtime delights. Their pies were truly excellent. With an exceptionally knowledgeable and friendly bar staff to guide our beer choices (fittingly, we both drank Cromarty’s Happy Chappy), it was one of the outstanding lunchtime experiences of 2014. Next time you stop in for a beer, make a point of trying their excellent pies, too. I’ve enjoyed Lunchquest’s recommendations for the last couple of years and these had come up trumps on many an occasion with highlights being Mithas for Indian, Kanpai for sushi and Origano for pizza. So it was a pleasure to sit down and have lunch with the font of Edinburgh food knowledge. 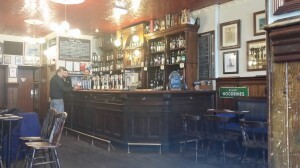 I’d been to Bow Bar for drinks before and they have a good range of craft ale and whisky. However, it was not the Happy Chappy pale ale which I ordered that was under scrutiny. Instead it was the list of lunchtime pies on the chalkboard menu that we were drawn to for today’s quest. There were five to choose from and all sounded tempting. The barman confirmed that for £3 we would receive “just a pie” and I couldn’t help but order two, opting for a steak and blue cheese pie and a bridie. The pies arrived very quickly and it was clear that the barman had undersold things as the pies came with an excellent beef gravy and were definitely in a category of more than “just a pie.” I started with the bridie – really good buttery pastry and lots of filling with the right amount of spice added to the mince. Probably the best I’ve had in Edinburgh. The steak and blue cheese pie was also delicious although they hadn’t been shy with the blue cheese which threatened to overpower the steak – again very generous filling with lots of quality steak. 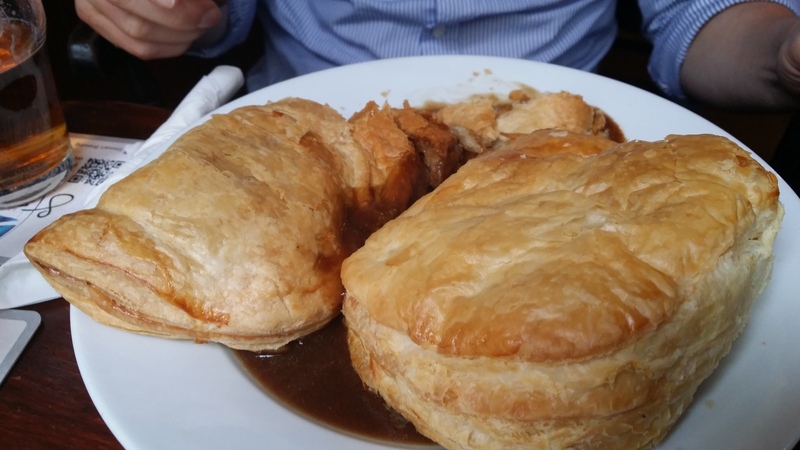 Overall I was really pleased with the pies at Bow Bar and would gladly recommend to anyone in the mood for a lunchtime pie and a pint. I think you’d be hard pressed to find better.